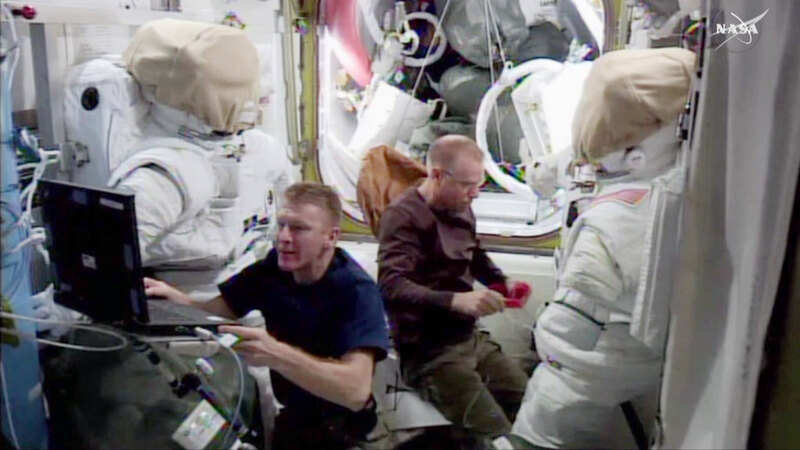 Astronauts Tim Kopra and Tim Peake ended their spacewalk at 12:31 p.m. EST with the repressurization of the U.S. Quest airlock following an early termination of the spacewalk after Kopra reported a small water bubble had formed inside his helmet. Commander Scott Kelly will assist the crew members with an expedited removal of their spacesuits and helmets. 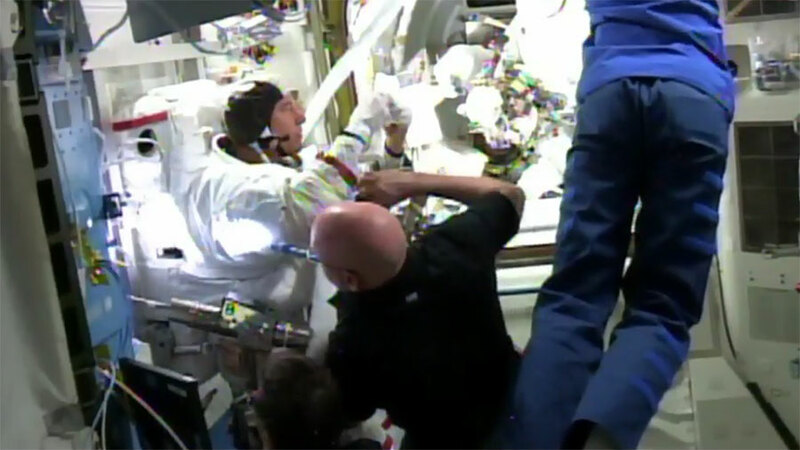 Once they have removed the spacesuits and helmets, the astronauts will use a syringe to take a water sample and retrieve the helmet absorption pad to determine what may have prompted the water to form inside Kopra’s helmet. The crew was never in any danger and returned to the airlock in an orderly fashion. The astronauts replaced a failed voltage regulator that caused a loss of power to one of the station’s eight power channels last November, accomplishing the major objective for this spacewalk. Approximately 2 hours into today’s spacewalk, astronauts Tim Kopra and Tim Peake have completed the replacement of a failed voltage regulator that caused a loss of power to one of the station’s eight power channels last November. The astronauts will now continue with additional tasks, including the routing of cables in advance of International Docking Adapter installment work to support U.S. commercial crew vehicles. The solar arrays that convert energy to electricity on the space station are made of thousands of solar cells. Altogether, the arrays can generate 84 to 120 kilowatts of electricity — enough to provide power to more than 40 homes, and the space station’s electrical power system is connected by eight miles (12.9 kilometers) of wire. 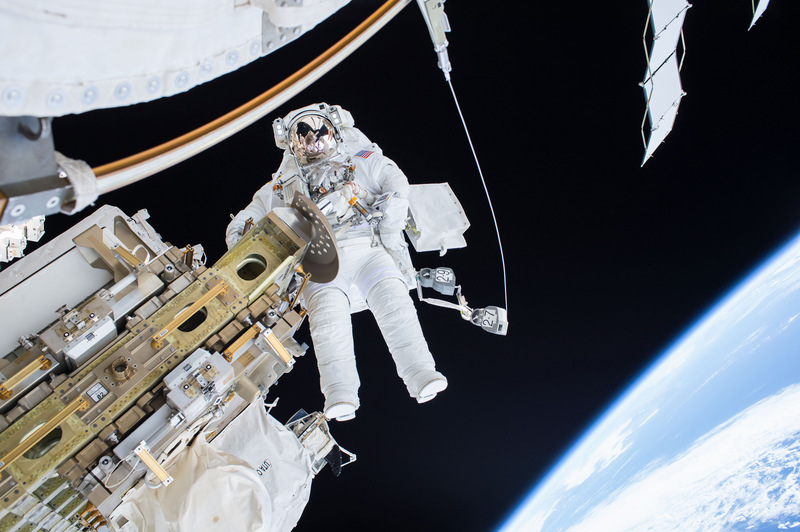 NASA’s Timothy Kopra and ESA’s Timothy Peake will perform 6.5 hour spacewalk on January 15. Astronauts Tim Kopra and Tim Peake switched their spacesuits to battery power at 7:48 a.m. EST, signifying the start of today’s spacewalk, planned for about six and a half hours. Kopra is wearing a spacesuit with red stripes and is designated EV1. His helmet camera displays the number 17. Peake is wearing a spacesuit with no stripes and is designated EV2. His helmet camera displays the number 20. The astronauts are embarking on the 192nd spacewalk in support of space station assembly and maintenance to replace a failed voltage regulator that caused a loss of power to one of the station’s eight power channels last November. The Electrical Power System consists of an acre of solar panels that take in sunlight to generate, store, and distribute power. NASA Television is broadcasting the spacewalk at www.nasa.gov/nasatv. 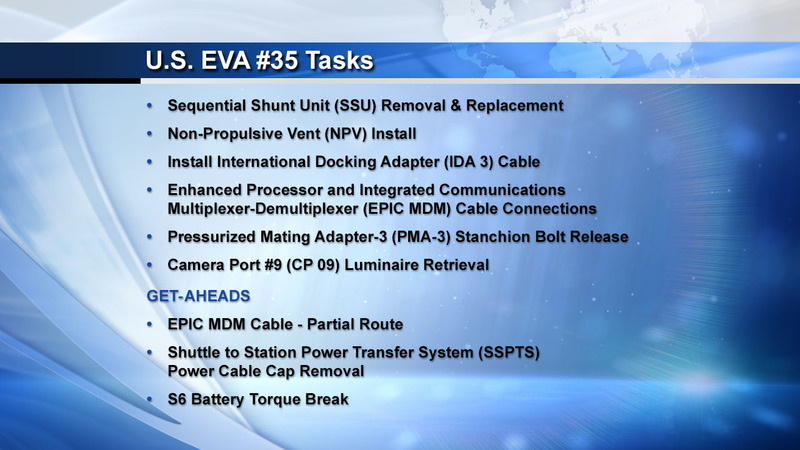 List of tasks to be performed during U.S. EVA #35 tomorrow at 7:55 a.m. EST. Commander Scott Kelly and one-year crewmate Mikhail Kornienko continue their contribution to the fluid shifts study with the aid of Russian cosmonaut Sergey Volkov. Data from this long-term study hopes to reveal correlations between the distribution of fluid in the body and changes in vision during prolonged stays in microgravity. Final preparations are underway for tomorrow’s spacewalk by Tim Kopra and Tim Peake to replace the failed Sequential Shunt Unit and regain the use of power channel 1B that went down on November 13. The 6 ½ hour spacewalk will also involve the spacewalkers deploying cables for the future installation of International Docking Adapters on Pressurized Mating Adapters that will accommodate the arrival of U.S. commercial crew vehicles. Tim Kopra readies equipment for Friday’s spacewalk which will be broadcast live on NASA TV. The crew is involved in a number of different experiments today, including more fluid shift studies, the SPRINT experiment, and experiment Matroyshka-R.
Tim Kopra was taking part in the SPRINT experiment today, which evaluates the use of high intensity, low volume exercise to minimize loss of muscle, bone and cardiovascular function. Russian cosmonaut Mikhail Kornienko is working with Matroyshka, which measures radiation dosages aboard the International Space Station. Tim Kopra, Time Peake, and Yuri Melenchenko will be reviewing medical training and CPR procedures today. 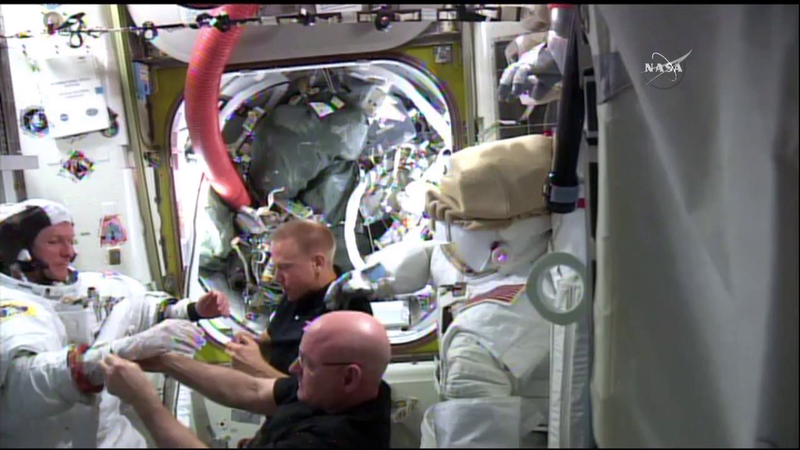 Preparation continues for Tim Peake and Tim Kopra for Friday’s 7:55 a.m. EST spacewalk. Today, they will be re-familiarizing themselves with the tools needed to perform the Sequential Shunt Unit (SSU) change out. Aside from spacewalk preparation, Commander Scott Kelly and Tim Peake will also be setting up the JAXA Electrostatic Levitation Furnace (ELF) equipment. It will be installed into the Multi-purpose Small Payload Rack 2 (MSPR2) work volume inside of the Japanese Experiment Module (JEM). Commander Scott Kelly and Mikhail Kornienko continue their fluid shift activities with help from Russian cosmonaut Sergey Volkov. Today’s activities are the third part of this experiment in which the Russian Chibis (Lower Body Negative Pressure – LBNP) is worn and ultrasound measurements of their eyes are taken. 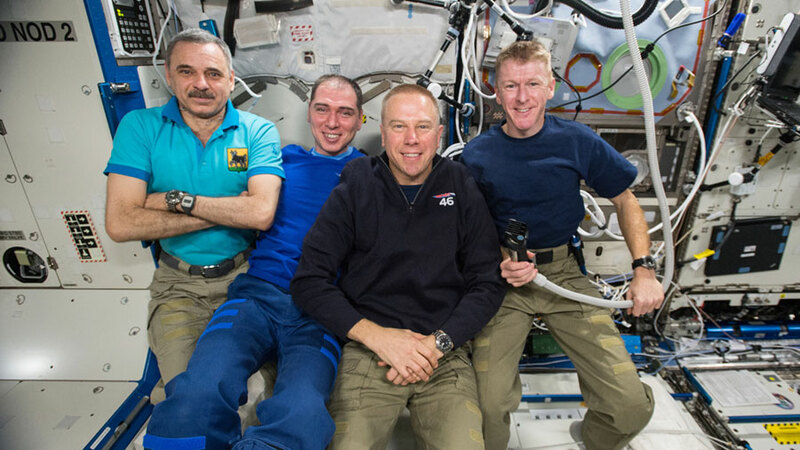 Four crew members of Expedition 46 pose for the camera after taking turns getting a quick haircut onboard the International Space Station. From left to right: Roscosmos cosmonauts Mikhail Kornienko and Sergey Volkov, NASA astronaut Timothy Kopra and ESA (European Space Agency) astronaut Timothy Peake. Two astronauts were back at work today preparing the spacesuits and tools they will use next week during a maintenance spacewalk. 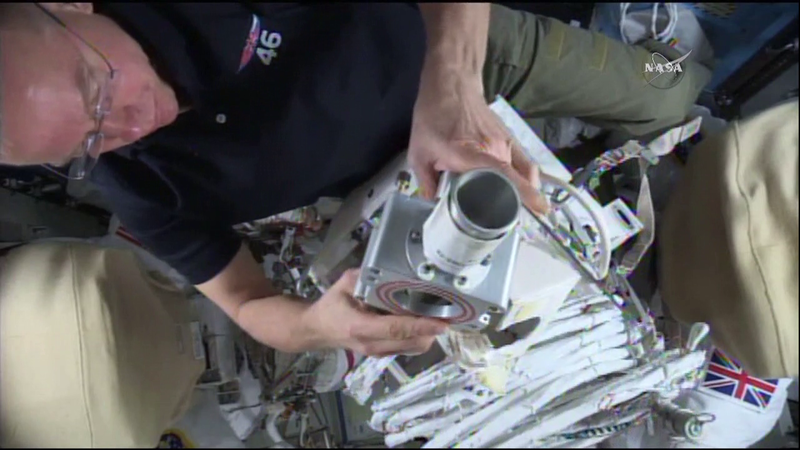 The crew also wrapped up some plumbing work while continuing a wide variety of space science. Flight Engineers Tim Kopra and Tim Peake checked out their U.S. spacesuits ensuring a good fit and readied their spacewalk tools. The duo from the United States and Britain will exit the International Space Station Jan. 15 to replace a failed voltage regulator and work on other maintenance tasks. The station’s restroom, the Waste and Hygiene Compartment, is back in operation after some parts and cables were replaced. That work was completed after a leak was discovered. Commander Scott Kelly joined his fellow One-Year crewmate Mikhail Kornienko for the ongoing Fluid Shifts study. That experiment explores how microgravity increases brain pressure pushing back on a crew member’s eye possibly affecting their vision. Kelly observed a moment of silence this morning to mark the 5th anniversary of the shootings in Tucson, AZ. Rep. Gabrielle Giffords, married to Kelly’s twin brother and ex-astronaut Mark Kelly, was gravely wounded that day. Kelly, who was in space that day as commander of Expedition 26, was joined by his crewmates today for the silent moment. Two astronauts are preparing a pair of U.S. spacesuits to get ready for next week’s spacewalk to continue the maintenance of the International Space Station. In the midst of those preparations, the six-member Expedition 46 crew is proceeding with ongoing space science to improve life on Earth and benefit future astronauts. Tim Kopra from NASA and Tim Peake from the European Space Agency will be the spacewalkers on Jan. 15. They will work outside for about six-hours and 30-minutes to replace a failed voltage regulator, rig cables for future International Docking Adapters and perform other maintenance tasks. The station residents also worked throughout the day on a variety of experiments exploring human research, physics and other advanced subjects. Commander Scott Kelly joined cosmonaut Mikhail Kornienko for the Fluid Shifts study. That experiment observes how microgravity increases brain pressure which may push back on a crew member’s eyes, resulting in changes to their vision. Peake and Kopra also participated in life science experiments exploring heart function during long-term space missions and the efficacy of medications in space. NASA astronaut Tim Kopra is seen floating during a spacewalk on Dec. 21, 2015. 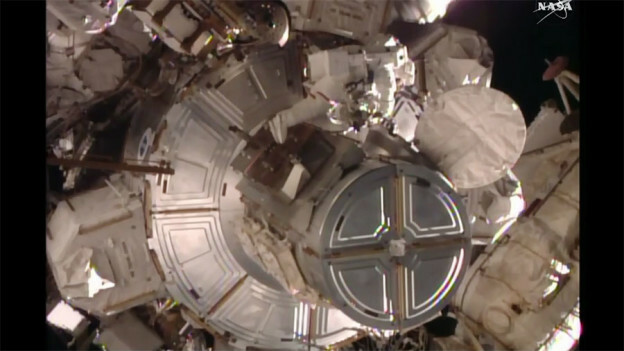 Astronauts Tim Peake and Tim Kopra are getting ready for a spacewalk next week to replace a failed voltage regulator. The duo are scheduled to work outside for 6.5 hours on Jan. 15 for the replacement work and other tasks. In preparation, Kopra worked on the U.S. spacesuits today that he and Peake will wear next week. Peake, a British astronaut with the European Space Agency, began collecting and configuring their spacewalk tools. The Expedition 46 crew also continued more advanced space science research onboard the International Space Station. Commander Scott Kelly joined his fellow One-Year crew member Mikhail Kornienko for the Fluid Shifts study. That experiment explores how microgravity increases brain pressure which pushes back on a crew member’s eyes, resulting in changes to their vision. Cosmonaut Sergey Volkov studied radiation exposure, how international crews relate during missions and worked on maintenance tasks. His fellow cosmonaut and flight engineer Yuri Malenchenko looked at magnetic fields and coulomb crystals and transferred cargo from the newest Progress 62 cargo craft.